There I was in Rio Dulce. I spent one day on a boat ride to and from Livingston, and another day trying to get information on how to get to Flores in the Petén. One of my guidebooks named two travel agencies that were on a street just north of Bruno’s, where I was staying. I spent hours going up and down streets and not finding anything that looked like a travel agency, let alone a shuttle bus service. Besides, I had the feeling that the type of people who hung out in Rio Dulce weren’t all that interested in visiting Tikal. Finally, I decided to take a public bus to Flores. Litegua didn’t go there. I saw no office for Dorado. Fortunately, the Fuente del Norte (FDN) office was very helpful. There was a 9:30 AM bus for Flores for only 65 quetzales ($8.30 in dollars). The bus started in Guatemala City around midnight and wound up, some fifteen hours later in Flores. Technically, it was a first class bus; but I had been warned that Fuente del Norte was less than cream of the crop. The next morning, I showed up at the FDN office just as it was opening around 9 AM. I sat down in the waiting room. Fortunately, the bus arrived just after 9:30. Being a de paso bus (i.e., filled with passengers from earlier points on the route). 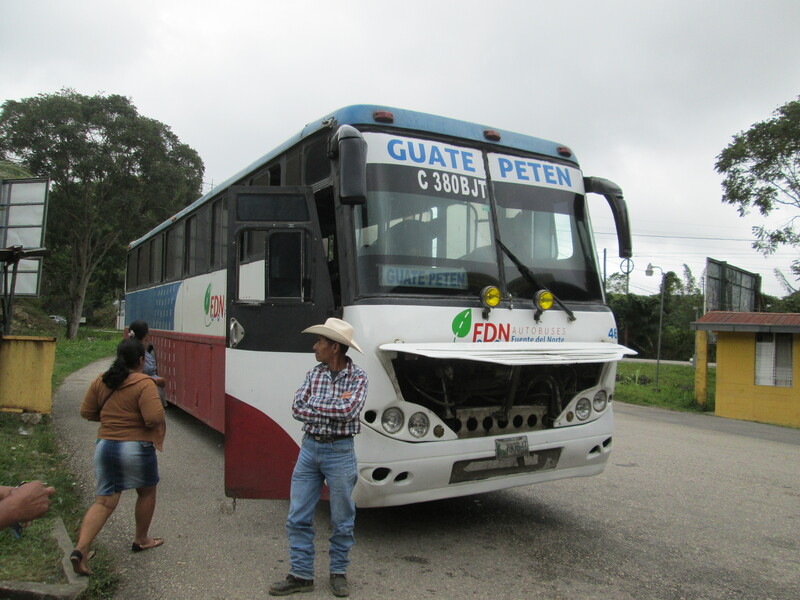 Sometimes, a de paso bus arrives filled to capacity with passengers; this one had space for all the passengers who were waiting at the Rio Dulce office. Among the passengers who a British and a German couple. Other than myself, the rest of the passengers were Maya. I had been prepared for a grueling ride, and it was that. I was wearing an adult diaper in case the ride lasted long without any restroom breaks. (Fortunately, there was a bathroom break in Poptún, midway along the route.) The ride was fiercely uncomfortable because all the bus seats appeared to be broken in different ways. And, as the bus barreled down the highway at high speed, I felt I was being shaken, not stirred. At least the bus got me there in one piece. This entry was posted in vacation and tagged buses, flores, guatemala, rio-dulce. Bookmark the permalink.